Pilates Fitness is the first Pilates Studio in Singapore to provide functional Pilates classes created specially for Desk-Bound Workers, Athletes and Youth. We are the first and only Singapore Pilates Studio that provides effective Pilates classes for Weight Loss, Athletes and Youth. Our Pilates routines are designed to mimic the movements of daily activities to help your body to function more efficiently and effectively. Our instructors always strive to keep the class fun & exciting by modifying each Pilates exercise based on the clients’ posture and fitness level. With only a maximum of 10 people in every class, our instructors are able to provide individualized attention to all clients. This is almost like attending a Private class at only 1/3 of the price! 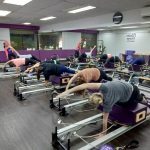 Pilates Fitness offers unlimited Pilates Reformer classes. Clients who attend our Pilates classes more than twice a week will benefit from these huge savings! 4. 100 Pilates Classes Weekly & Counting! We engage full-time Pilates Instructors in our Pilates studio, which allows them to be fully committed to your growth and development. Attending classes with different instructors every time makes it difficult for the instructor (and yourself) to keep track of your progress. This also helps our clients to understand their body better & see faster results! stronger core & relief from your pains!